Australia has been at war continuously since 2001, when we joined the US invasion of Afghanistan following the terrorist attacks of September 11 that year. This is the longest period of warfare we have ever been engaged in. We joined the illegal invasion of Iraq in 2003, which increased Australia’s risk as a terrorist target. Australian leaders have continued to commit our troops to counter-productive and ill-advised US military ventures in the Middle East and Afghanistan, which create immense human suffering. War is becoming “normal” for us. Young Australians grow up in an environment where dispatching the troops, making the weapons, and preparing for the next war are all part of what their country does with little apparent questioning by our decision-makers. We commemorate the losses on our own side (at huge financial cost), pay scant regard to the horrific civilian losses from our wars in distant lands, and learn no lessons from past errors. This is all despite the fact that Australia is relatively secure. The government’s 2016 Defence White Paper stated (page 15) that “there is no more than a remote prospect of a military attack by another country on Australian territory in the foreseeable future”. Australia’s military budget is increasing sharply, with tens of billions of dollars being spent on large weapons systems designed to fight major wars. Building weapons is promoted as simply creating jobs, with little thought for the messages this sends to other countries. Weapons companies increasingly encroach on our under-funded schools and universities, with curricula tailored to their own corporate needs. Meanwhile, our foreign aid, which could help build good international relations, withers to all-time low levels. Our capacity for diplomacy has similarly dwindled, so that going to war is often seen as “the only option”. In the ACT, MAPW campaigns against the promotion of weaponry in adverts at Canberra Airport (see http://noairportarmsads.org.au.) and calls for a cessation of weapons company sponsorships of the Australian War Memorial. In Victoria, MAPW campaigns against the Avalon air-show and its promotion of fighter aircraft as family entertainment. Australia retains a strong military alliance with the US, despite the concerns of many Australians that our role in the alliance is a subservient one that undermines our own independence. 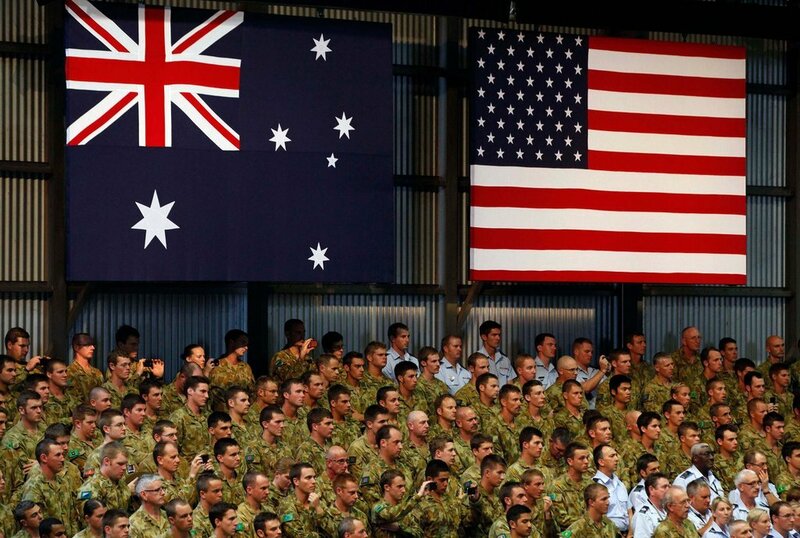 Australia has joined every major US war since World War II. Interoperability with the US is key to Australian military planning. US bases here are larger and more numerous than they were at the end of the Cold War. The Pine Gap facility near Alice Springs plays a critical role in US nuclear weapons targeting, drone attacks against countries with which we are not at war, and large-scale intelligence gathering. The strength of the US alliance compromises our capacity for independent thinking in our foreign policy. MAPW supports IPAN, the Independent and Peaceful Australia Network. Decisions on the most important of all decisions that a country can make, going to war, are made by the Prime Minister, with or without input from Cabinet. Our elected representatives in parliament have no opportunity to ask questions, debate the issue or influence the decision. MAPW supports Australians for War Powers Reform. Australia strongly supports the policy of “extended nuclear deterrence” whereby US nuclear weapons are said to protect us from nuclear attack by other nations. It is a deeply flawed and dangerous doctrine, and is a major impediment to Australia’s support for the prohibition and elimination of nuclear weapons.